Volunteering is a great way to meet people and find fulfilling and worthwhile ways to get involved with your local community. And now finding out what volunteering opportunities are out there is easier than ever. 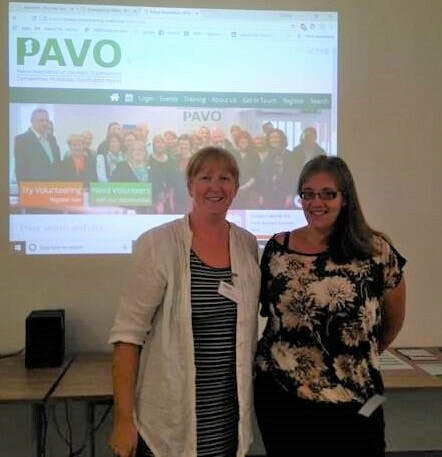 The Comm is now working with PAVO (Powys Association of Voluntary Organisations) to match volunteers with organisations working to improve life in the area. Our volunteer coordinator Louise Hardwick is be based in the Comm front office on Monday and Tuesday mornings and Wednesday afternoons and will be working alongside Ceri, the Centre’s Administrator. The volunteer coordinator role is paid for by the Welsh Assembly through PAVO on an annual basis, and there are strict requirements to recruit 44 volunteers a year, including a number of young volunteers. ​Follow this link to the Knighton volunteer hub Facebook page. ​Alternatively, Click on the PAVO logo below to see a constantly updated list of volunteering opportunities in the area. Louise can also be contacted on volunteerhubknighton@gmail.com or by using the Contact page on this website. Of course, Louise would be happy to meet prospective volunteers if you want to call in at the Comm front office at the times mentioned above. Louise, our Volunteer Coordinator, on the left, with Ceri, the centre's new administrator. Apart from a few paid hours of cleaning and caretaking, Knighton and District Community Centre got where it is today through its fantastically committed and enthusiastic volunteers. Firstly, there's the management committee, some of whom are at the community centre daily, with sleeves rolled up, doing all sorts of everyday jobs like setting up tables and chairs for events and hirings, weeding the flower and herb beds, doing minor repairs and so on. That's in addition, of course, to the less visible but incredibly time consuming tasks of taking bookings, issuing invoices, dealing with bills, maintaining the financial accounts, ordering stock, showing round prospective hirers, maintaining a diary of events, running this website, the Facebook page, doing press releases, and the mammoth job of identifying funding sources and completing the applications for such funding... the list is dauntingly long. In addition, there are small bands of dedicated volunteers who staff the market and library cafes, help to run Flicks in the Sticks screenings and live music events. They are a happy bunch and without them there would be no community centre. If YOU would like to help out we'd love to hear from you. Just send a message via the contact page of this website. We are currently particularly interested in hearing from anyone who has sound or stage lighting engineer experience to help develop our live music events programme.